Investments in the community and the political arena pay dividends, writes IHRSA Assistant Vice President of Government Relations Jeff Perkins. The fitness industry seems to attract positive people whose professional passion is to help others learn how to live healthier lives and confront the challenges they encounter daily—head-on and with a smile. How many other businesses encourage people to strive to be their very best, both physically and in every other respect? That—in short—is the raison d’être, as well as the defining goal, of our industry. It’s no surprise that IHRSA’s members contribute to their local communities in a wide variety of important ways—by awarding scholarships to disadvantaged or at-risk youth, by donating fitness equipment to area schools, by partnering with other organizations to pursue a common good, by working with veterans and people with disabilities ... and so much more. While the good deeds themselves may be the driving force, it’s reasonable to acknowledge and capitalize on the secondary, spin-off results—the positive unintended consequences. If you’d like to become even more involved in your community, to have your club become synonymous with public generosity and good-will, here are several things you can do that will pay dividends down the road. At the moment, we’re living in a politically charged environment, so you may be inclined to withdraw from anyone or anything involved in the political spectrum. However, the current upheavals notwithstanding, your local and state officials continue to make decisions that affect your operation, so it makes sense to get to know them better so that—as IHRSA’s credo points out—you can “grow, promote, and protect” your business more effectively. The key to success in today’s contentious times is to focus exclusively on health club concerns in your discussions—nothing else. If you develop a relationship with local officials, you’ll have the opportunity to help them understand how your business works, and to explain that, among the industry’s major objectives are increasing physical activity, fighting the obesity crisis, improving public health, and reducing healthcare costs. Whenever you donate time, money, or services to a public cause, let people know, and whenever you host a charitable or other event at your club, invite your city councilors, state representatives, and other appropriate individuals to attend. These situations offer a unique opportunity to get acquainted in a pleasant social setting. The resulting relationships can prove invaluable when dealing with problematic issues, such as new tax proposals, automatic membership renewals, restrictive ordinances, and unnecessary legal requirements. Be sure to review the notices that IHRSA’s public policy department sends out each week on these and other topics. And, whenever you stage an event, hold an open house, or host other gatherings, reach out also to the leaders of local businesses and organizations. That way, you’ll get to meet people that, otherwise, you might never get to know. Expanding your circle of connections can open the door to unexpected opportunities—e.g., new business relationships, cross-promotional programs, the sharing of valuable information. If you’re consistently active in your community, you’ll be viewed as a respected and trusted leader—someone that people will seek out. 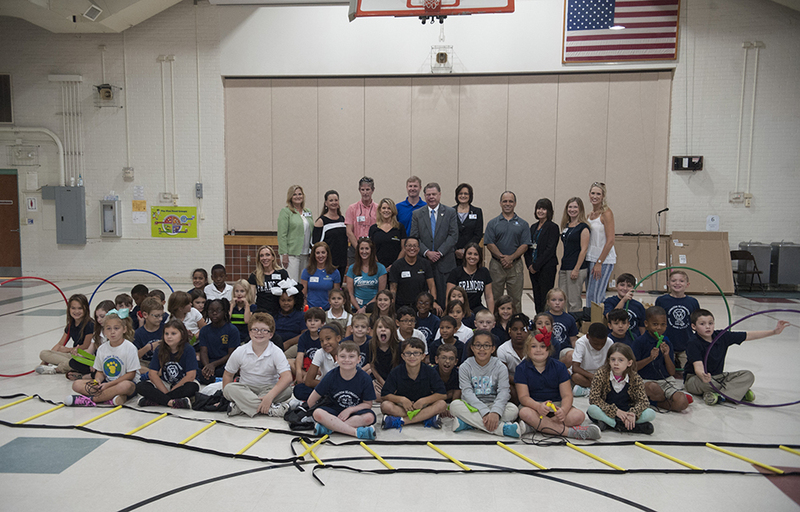 Stone Creek Club & Spa and parter gyms donated fitness equipment to students. It’s appropriate, as well as rewarding, for you to take some credit for the good that your club, your staff, and your members are accomplishing, so share the news with others. Having a reservoir of good-will in your community can be a resource to draw upon when, for instance, new competition comes to town. It’s particularly useful if the newcomer is a tax-exempt fitness organization, which so often benefits from an aura of selflessness. Politics is about people, and if your club is regarded as an integral part of the community, a threat to it can seem a threat to the community as a whole. Rallying support for your interests will be much easier if people know you and your club well. As IHRSA chair Jim Worthington, the owner, president, and CEO of the Newtown Athletic Club, in Newtown, PA, has recently pointed out, you also can have a positive national impact by actively supporting passage of the PHIT (the Personal Health Investment Today) Act. This bill would allow Americans to use tax-deferred flexible spending accounts (FSAs) and health savings accounts (HSAs) to pay for a variety of exercise-related products and services, including club memberships and fitness equipment. Incentivizing exercise will benefit the entire U.S. industry and all Americans. Use community outreach programs to bring new members in the doors—and get them to stay.